I remembered the first time hearing the name of The Good, The Bad and the Queen on the radio; What? The good, the bad and the clean? What kind of name is that? But of course now, it makes a lot of sense suggesting as to what the world is naturally divided into: the good, the bad, and the queen; neither good nor bad, neither right nor wrong, just simply the queen – clever. 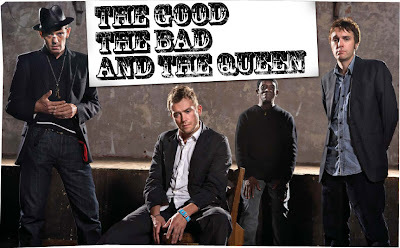 “The Good, the Bad & the Queen” consists of prime members, Damon Albarn (previously known from Blur and Gorillaz), Clash bassist Paul Simonon, the Verve guitarist Simon Tong, Afro beat legend Tony Allen on drums and Danger Mouse behind the mixing desk. The name though makes no reference to the name of the band, but more precisely to the name of the ‘project’. In their self-titled debut, expect no standard, predictably conventional tracks despite of all the ‘big band’ names that lurk behind this project; although the slight sounds of the ‘Blur’ effect is unavoidable. Words that relish in the bareness of the surroundings and melancholic post-modern melodies that slowly creeps its way through; blatantly audible in tunes like ‘Kingdom of Doom’ and ‘Northern Whale’ that are perfectly formed to pacify your day. A good enough reason to be adventurous and give the band a ‘go ahead’.